How to Prove a Product Liability Claim | Machi & Assoc. What Do You Need to Prove a Product Liability Claim? Home » Blog » What Do You Need to Prove a Product Liability Claim? The U.S. Consumer Product Safety Commission (CPSC) has found that each year, millions of Americans receive injuries from faulty, defective, or downright dangerous consumer products. By analyzing data pulled from emergency rooms and hospitals around the country, the CPSC can discover what products are causing an inordinate amount of injuries and then lean on manufacturers and retailers to recall these defective products. If you’ve been injured by a consumer product, even if you haven’t incurred medical expenses yet, you may have grounds for a product liability lawsuit. Below is information on the three types of product liability claims and what evidence you’ll need to prove that a manufacturer or seller is liable. 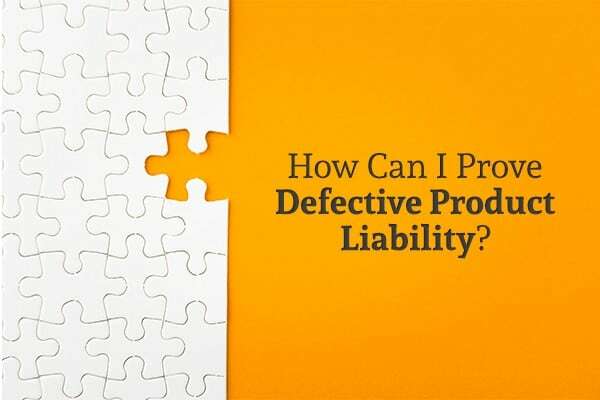 Product liability claims are a subset of personal injury law and are further subdivided into three discrete categories: (1) defective manufacturing, (2) defective design, and (3) failure to warn. When a product suffers from a defect that occurs after design and during the manufacturing or packaging process, the liability claim is based on defective manufacturing. In some cases, a defectively-manufactured product may be the only one like it in the store, while in other cases, a large-scale manufacturing defect could prompt a company to recall an entire shipment of a certain product. Manufacturing defects can include things like jagged edges, unsecured screws/connectors that make the product unstable, or contamination. Some products are dangerous because of an inherent flaw in the design. This can include things like electrical shorts that cause small appliances to overheat or melt, easy-to-open caps that allow children to access powerful narcotics, or top-heavy furniture that can easily tip over and injure someone (such as furniture that falls on children). The “Big Tobacco” case brought against Phillip Morris is one of the largest defective design lawsuits in the US. A consumer who alleged cigarettes were to blame for her lung cancer recovered a record-breaking $28 billion judgment against the cigarette manufacturer (although this amount was later reduced to $28 million). Since the jury concluded that there was no safe human use for cigarettes and that the warning labels attached to each carton were insufficient to protect consumers, this was deemed a defective design case rather than a manufacturing defect or failure-to-warn situation. The final category of product liability claims involves a manufacturer’s failure to provide adequate warnings regarding how to use the product correctly. Some products, especially those that involve fire or require electricity, may be generally safe but still pose some danger to unaware users. By providing explicit warning labels or detailed instructions on the safe use of the product, manufacturers can protect themselves from liability claims if an injury does occur. In other cases, a product may seem safe but have some hidden danger that’s not readily apparent. Warnings are even more important in these situations, as the appearance of general safety can lull users into a false sense of security. You suffered physical, emotional, and/or financial damages. Each of these factors will need to be established through a sufficient amount of evidence. A failure to prove even one of the above elements will mean that the entire claim fails. If you prevail in a product liability case, you could be entitled to both compensatory and punitive damages. Compensatory damages can include lost wages, medical bills, property damage, and other out-of-pocket expenses. Punitive damages are designed to punish the manufacturer and prevent future such incidents, so they won’t necessarily be related to the actual amount of damages you sustained. In some cases, the punitive damages awarded to a prevailing plaintiff far exceed the amount awarded in compensatory damages. Toxic torts like chemical spills that can contaminate the water, soil, and air. If you’ve suffered from one of the above conditions, or have another product liability claim you’d like to pursue, contact Machi & Associates or visit our website for more information.